Shutdown “surrender”: How Boehner and House Republicans move the goalposts in the debt ceiling debate. If Republicans don’t like the shutdown, why do they say ending it would be “surrender”? House Speaker John Boehner (R-Ohio) speaks during a news conference with House Republicans at the U.S. Capitol on Oct. 4, 2013. George Stephanopoulos: [Reid] said … that you came to him back in July and offered to pass a clean government funding resolution—no Obamacare amendments—that was $70 billion below what the Senate wanted. They accepted it, and now you’ve reneged on that offer. Boehner: Now, clearly there was a conversation about doing this. Stephanopoulos: And you offered a clean resolution. Boehner: But I and my members decided that the threat of Obamacare and what was happening was so important that it was time for us to take a stand. And we took a stand. So Boehner reneged. Just before the shutdown deadline, he added a demand that Obamacare be defunded. Reid refused. At a meeting at the White House on Oct. 2, Reid offered to stick with the original deal: Pass a clean continuing resolution, then we’ll talk about Obamacare. Moderates floated the idea of a short-term increase in the debt ceiling, to give both sides time to iron out their differences. This would give Republicans what they wanted—a broader negotiation over various policies—while allowing them to withhold, as leverage, a long-term debt-ceiling hike. But conservatives insisted that even a short-term increase had to include policy concessions. Boehner ridiculed the offer to talk after a debt-ceiling extension. “Complete surrender, and then we’ll talk to you,” he called it. If there’s a way to solve this, it has to include reopening the government and saying America is not going to default, it’s going to pay our bills. They can attach some process to that that gives them some certainty that, in fact, the things they’re concerned about will be topics of negotiation … If they want to say, “Part of that process is we’re going to go through line-by-line all the aspects of the president’s health care plan that we don’t like, and we want the president to answer for those things,” I’m happy to sit down with them for as many hours as they want. 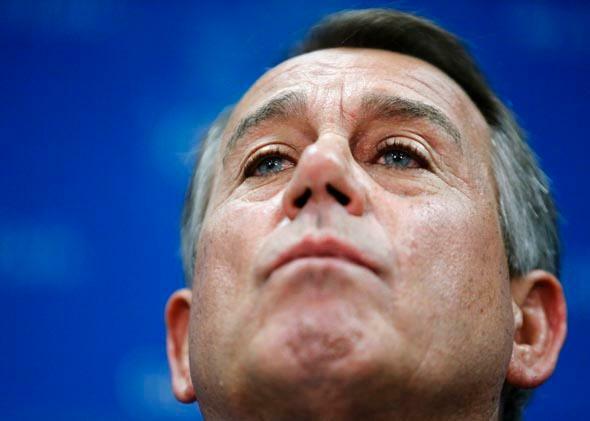 By redefining “surrender,” Boehner keeps moving the goalposts. But he does it in a clever way. He doesn’t lengthen the field, in the tradition version of the metaphor, so that the other team can’t score. He shortens the field behind him as he advances. The end zone he’s defending—the line he can’t retreat behind, since that would be “surrender”—moves steadily forward so that his back is always against it. Correspondingly, the middle of the field, where compromise seems reasonable, is always halfway in front of him. Eventually, he’s on your 10-yard line, and the logical place for compromise is on your 5-yard line. The speaker the other day said that it would be unconditional surrender to reopen the government. That doesn’t make sense to a lot of people. I mean, if we just go back to the point where the budget is exactly where it was before the shutdown occurred, and both parties sit down and negotiate, but people are put back on the job … I don’t think anybody would consider that a concession to me or the Democrats. John Boehner described it as unconditional surrender just to reopen the government. Now, it’s hard for me to understand why that would be. He said he didn’t want a shutdown in the first place. I don’t want a shutdown. Well, on that we should at least be able to agree. That was more than a rebuttal. It was an attack. Throughout the shutdown, Boehner has played a double game. On the one hand, he claims that House Republicans don’t want the shutdown. On the other hand, he insists that ending the shutdown would be surrender to Obama. The second claim contradicts the first. If Republicans don’t like the shutdown, then ending it, per se, would be good for them, regardless of other issues. The only way they could honestly perceive the restoration of government funding as a concession is if they want it less than Obama does. In a press conference Thursday morning, Boehner and his lieutenants, having taken several steps forward, took one step back. They accepted Obama’s most recent offer to begin larger policy discussions in exchange for a short-term increase in the debt limit. But they offered no concessions on the shutdown, and Boehner refused to answer questions about it. Why not, Mr. Speaker? Would ending the shutdown be “surrender”? If you don’t like it, why are you so reluctant to give it up?